Heather is working in the Casa Madera kitchen this afternoon preparing appetizers for the No Reason wine reception tonight at Vallarta Escapes. I do my part by staying out of her way and being the official taster. Watching her do this for the past weeks has caused me to think how far we have travelled in two years. 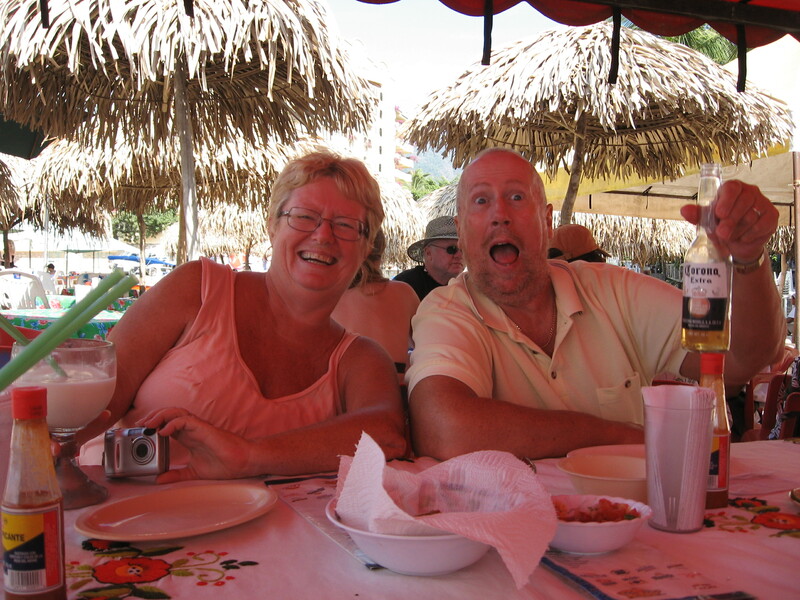 The hosts at Vallarta Escapes are great friends to us and have introduced us to many people at these receptions. It’s nice to have friends. People we can count on when we are looking for something or someone. People who can lend us a hand when need be or people that we can help out. People to celebrate with at weddings, birthdays, arrivals, departures or to celebrate with for no reason at all except a bunch of friends want to get together. 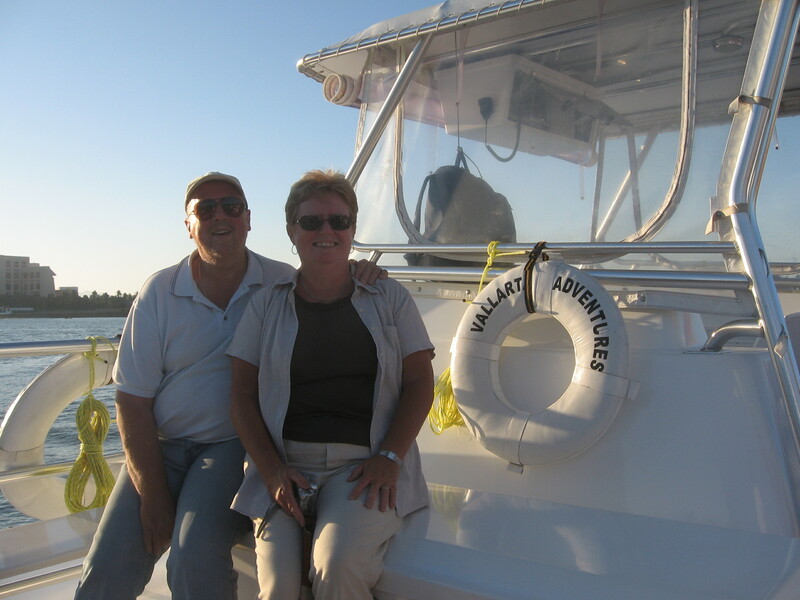 December 2008 – In the month we had been in Puerto Vallarta we had met a few people but a lot of them would really only be acquaintances. We really only had two friends, Robert and William Michael until we met Marco and that friendship was in its infancy. It meant that we did a lot of things ourselves. Which was fine, we were independent people anyway. The door bell rang one day when I was working on my computer in the condo while Heather was doing her work at the internet store because her computer was a Mac and was made of metal. This was not a good thing in a condo whose electrical system was not grounded! I wandered down the stairs to the main door where a couple were standing. They introduced themselves and said that they were looking for a place to rent for 3 months starting January 1st and the man next door said we were looking to rent ours. I told them that he had misunderstood us but we were not renting the unit out now because we were living there. They explained that they come every year and stay in their time share in the Pelicanos and then look for a place to rent for the rest of the winter. Time was running out. The end of December was coming and they had yet to find a place to stay. The couple took their leave and I went back to work not thinking much about it except to mention it to Heather later that day when she came home. Just after the new year Heather and I were out for a walk one evening and we ran into the man from the couple. I asked if they had found a place and he said they had. They were renting a unit over in La Joya. However his wife Marni was ill and was not moving out of the apartment. Again we talked for a while and then bid him good night. Heather asked me what his name was. I did not have the foggiest idea. I know they introduced themselves when they came to our door but that was at least a week ago. There was far too much rust in the cabeza to remember that little tidbit. The same thing happened about 4 or 5 days later. We ran into him wandering around the complex later in the evening. Again he explained that Marni was still sick and not leaving the apartment so he was forced to go to Blakes Sports Bar to watch his beloved Maple Leafs by himself. So we talked hockey for a bit, we said we were sorry that his wife was still sick and that he had to cheer for the Toronto Maple Leafs. After a couple laughs we parted again for the night. We started to see him quite regularly around the complex over the next week. Always alone. Marni was still sick so he was doing a lot of stuff by himself. I still had absolutely no clue what his name was. It was about a week later when we ran into both of them in the complex. Marni was feeling better and happy to be out of the apartment. We talked for a while but still there was no dropping of his name (which I now find amazing for the amount of times that Marni uses it with an exclamation point). It was a that point when he asked us if we liked movies. Well yes, but we have not gone to any recently, why? He explained that they go to the movies on Monday afternoons. They are inexpensive and you generally have the theater to yourselves. They were going on Monday and would we like to come. Sure we replied we would love to. We arranged that they would come by our condo at 2:00 and we would walk over to the cinema’s. Monday came and we still did not know his name. When they rang the bell we went downstairs and finally said, “you introduced yourself to me in December but I have not been able to remember your name to save my life, please tell us what it is”. With a giggle he said “Tony” and we were off. I cannot remember what movie it was that we went to that day but it was good. We wandered through the mall on the way back and stopped at Burger King for a cone. It was a perfect way to get to know each other. Marni & Tony invited us back to their place for a drink which turned into a couple before we wandered off. This became a regular Monday occurrence. Movies, Burger King cone and then dinner and cards. But Mondays also turned into Tuesdays, Wednesdays, Thursdays or any day of the week for that matter. Dinners, lunches, drinks at Victor’s (home of the free tequila with every drink order), or just plain old wandering around. Marni & Tony had been coming to Vallarta for years and knew the town like the back of their hands are were not afraid to share their knowledge. Over the course of those first 3 months we had a hoot. It was like we had known them for years. Now some will say it was because we were starved for company and at first some of that may be true but I really think it was due to the fact that we all fit nicely together. Tony and I shared the same affinity for Cerveza and Heather and Marni could just sit back and watch the destruction. We have had a lot of firsts with Tony & Marni. The first bad movie, Quarantine (hey when there is nothing else at the theater in english you take what you can get), was so bad we still talk about it. The first visit to Naty’s Cantina for pork day. The first visit to the Mismaloya Beach. The first drive into the Valle. The first visit to Grenias’s (home of the best Arracherra in Vallarta). The first visit to the Hot Springs. They were also the first people to see our house which would become Casa Madera right after we bought it and did not run away screaming. The list is endless and without them it would have taken quite a long time for us to discover all of these things. We still do movie day but it was not as regular this year due to renovations in our house. When it came time for them to go home the first year Heather and I were beside ourselves. Now what the hell are we going to do, they had kept us so busy. It was a difficult couple of weeks after they went home. We could not wait for them to return in December. Today it is still the same. They go home next Friday and while my son will be here for a couple of weeks to take the sting off, we will still be counting the days until they come back in December. Lonely. Now there is a word. How many pop songs used it over the years? Hundreds, many of them my favourites because they were just great songs. The allmusic.com website lists over 1300 occurrences of the word in a song title. Song writers love it and for good reason. We can all identify with being lonely. For Heather and I at Casa Madera Bed & Breakfast, it hits us every once in a while but very rarely. When it hits though, it hits. The nice thing is that family does come to visit. My son, Brendan is coming next weekend with a buddy to celebrate his 21st birthday. I cannot tell you how excited we are over that. Not that we don’t have friends here. We do, and they make sure we are never lonely. Christmas this winter was a special treat. My brother, Larry and Heather’s mother, Barbara were here. That made Christmas extra special this year. Christmas for both of us revolves around family and having family here this year was wonderful. That and our friends kept us busy. Christmas Eve at Robert & William Michael’s, Christmas Day dinner at Bill & April’s. To be surrounded by good friends and family makes it so special. 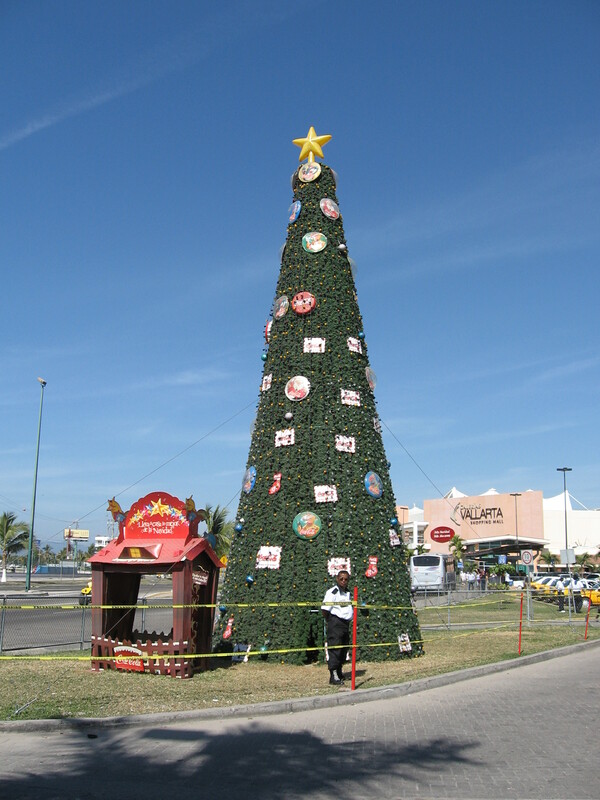 It was so far removed from our first Christmas in Vallarta. December 24, 2008 – Christmas Eve. A totally different Christmas Eve than either one of us has ever experienced. One it was 26 degrees and there was no snow, ice or threat of slush. Two, our families were 2ooo miles north of us. This was the first Christmas either one of us had ever spent alone. Ok, so we were not really alone but I am sure you get the idea. We decided that we were going to do the day up right. Christmas Eve was the day that my family had dinner. It developed a long time ago as the family grew, people got married and had their spouse’s family to satisfy as well. That and the 24th of December was my parents anniversary. It just became THE day. This Christmas Eve was going to be obviously different. We knew three people in town. Robert and William Michael who were gracious enough to invite us to their Christmas Day dinner the next day. We knew Marco, but he was in Guadalajara with his Mother and Father. Other than them we were alone. The strangest part of the whole experience was that we were having a hard time getting in the Christmas spirit. For one, it was warm. The air conditioner was running in the condo. We were sweating when we went outside. Where was the snow? For many of us, even though we hate it, the first snowfall was what jump started us into Christmas mode. Well no snow here except for the frost layer in our freezer. We noticed when we first arrived in town 6 weeks before that Christmas trees were for sale. It seemed odd to see all of these trees basking in sunshine. If you took one home you did not have to wait for it to thaw before cutting the trunk and sticking it in water. Crazy. We did not buy a tree. One, where the hell would we put it. No space in the condo. We settled for a couple of artificial trees about 18 inches tall and decorated them with some small glass balls that we bought from Mega. They got set up in the stairway. 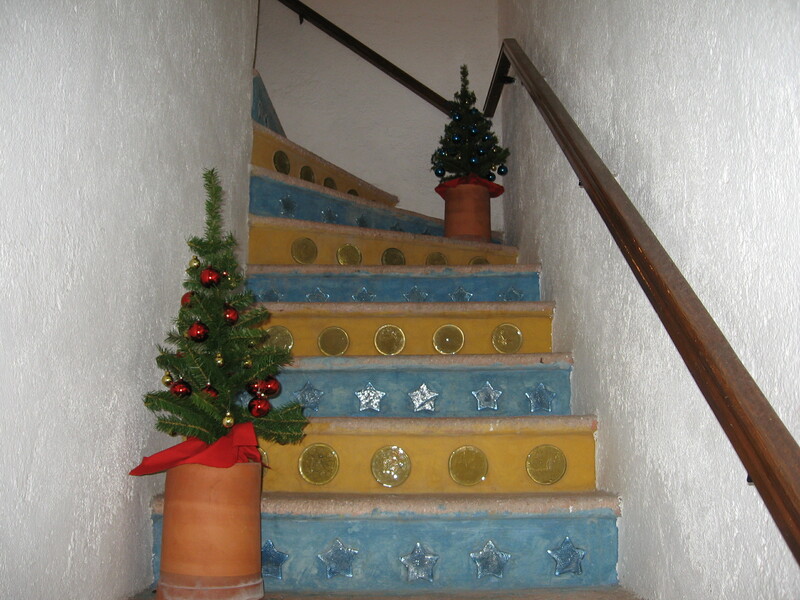 There, we were decorated for Christmas. This brought us to dinner. What were we going to have? We did not have a proper stove or oven so we could not cook a turkey. We could go out but what is open on Christmas eve? We had never been here before at that time so we had no idea what would be open or closed. We finally decided on an old favourite as they were just down the street. Yep, that’s right. KFC. The Colonel. It was a taste of home, what can we say. I can say, it was freaking great! 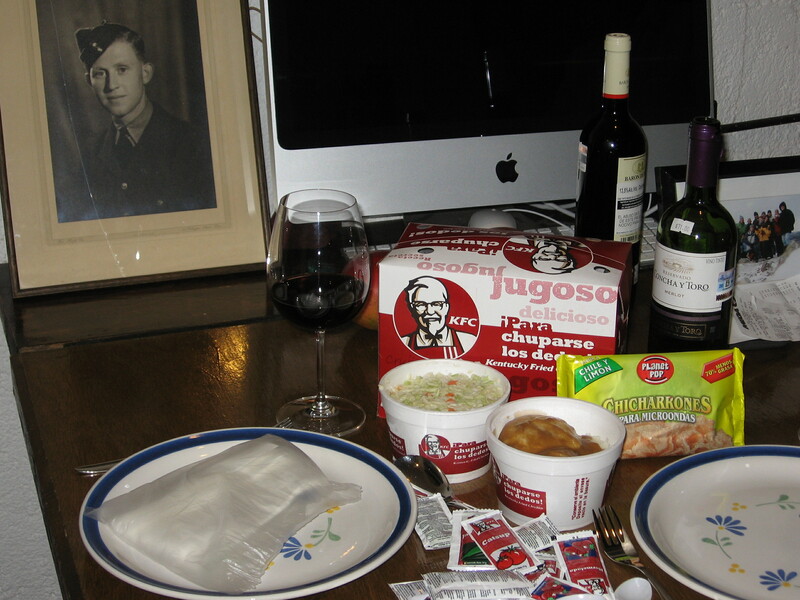 It was without a doubt the best KFC I had tasted in years. Well cooked fresh Mexican chicken done with the 11 herbs and spices. I could go on and on but lets just say we ate there more than once because it was so good. Christmas morning for anybody with children always starts early. We had been lucky as my children were old enough that they were past the getting up at 5:00 am stuff. So I was looking forward to a nice relaxing sleep filled morning on Christmas Day. I could not have been more wrong. 6:00 am I awake with a start to the sound of a bang. What the hell was that? Then there was another bang, followed quickly by another. Well I had to go see what was going on. I had noticed that Heather was no longer lying beside me so somehow she was involved. And involved she was, chasing a cockroach around the floor with a hammer! Bang, missed, bang, missed, bang, missed. Needless to say she eventually got it but by then I was up for the day. So much for the sleep in. We had been invited Robert & William Michael’s for dinner Christmas Day and asked to bring a green salad. We had the lettuce but Heather wanted a salad spinner, something that did not fit in the car when we moved. It was christmas day but to our surprise all the major stores were open so after we made all of the phone calls home we ventured out to see what we could find. Nothing, that’s what we found. No such thing as a salad spinner in Mexico. One of the stores, Mega, has helpers who double as time share salespeople. Well the gentleman we talked to that day told Heather she needed to become more Mexican and just whip the lettuce around in a towel like everybody else! Two months later we found one in Lans Department store. It has been followed by many others. Apparently not all Mexican women want to whip their lettuce around in a towel either! Dinner at Robert and William Michael’s was divine. The food was excellent and the post dinner entertainment provided by Los Bambinos was phenomenal. If you are ever here and get the chance to see them it is well worth the price of admission! We thank them for making that Christmas special. Our Christmas presents from home arrived on Boxing day. It was a nice way to finish the Christmas season and promptly caused Heather to cry. Were we lonely. Yes we were lonely but fate was going to change that very quickly the next day when our doorbell would ring…. Red Savina Hot Sauce – Heathers' Fresh Cooking on Ok, We are in Mexico, Let’s Cook Mexican! Kevin Wood on Ok, We are in Mexico, Let’s Cook Mexican! Stephanie Rivas on Ok, We are in Mexico, Let’s Cook Mexican!